The day before leaving for this year's Lumberjack 100 race (and self-created fundraiser for the CNCF), I received an e-mail from a 14-year old young man who lives in my home town of Marshall, MI. His name is Mark Sherman and he sent me a note to wish me good luck. He said that his mother told him about my race... but the most amazing part of this message was that he informed me he has been a Neuroblastoma survivor for 11 years! That's right, Mark is one of the few kids I have ever heard of, let alone personally met, that has actually beaten this deadly disease. The amazing part is that I have spent close to five years along side the Thomas Team as they battled this deadly disease first-hand for Christi. While Christi certainly left her mark on the world (and me personally), survival for her just wasn't in the cards. Through Christi's website I've received messages from literally all over the globe, but little did I know that a Neuroblastoma survivor was right here in front of my face. 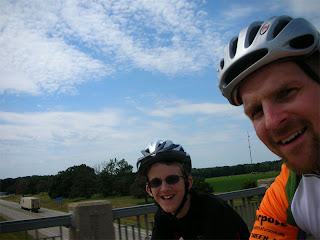 Mark's already set up his own blog site and is the newest member of the Pedaling with a Purpose fundraising effort. The day before Independence Day a few of my Team Active Racing teammates joined me for Marshall's Summer Playground Bike Rodeo and Mark came to help. We talked about safety, the importance of wearing a helmet (at ALL times) and had several different station set up for them to test their bike handling skills. All the kids had a blast and it was fun sharing the sport of cycling and getting kids excited about riding their bikes. After the Rodeo was over, "Shonger" and I took off for a ride and Mark joined us. We did about 12 miles and headed into the country. 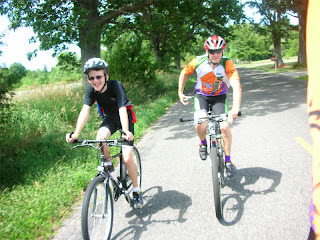 All of us were on our mountain bikes, so the pace wasn't anything to write home about, but that wasn't the point. I was amazed to be riding with someone that had actually beaten cancer and was joining me in helping to raise money along the way. I'm very excited about Mark's involvement with PWAP and look forward to many more rides over the next several years.